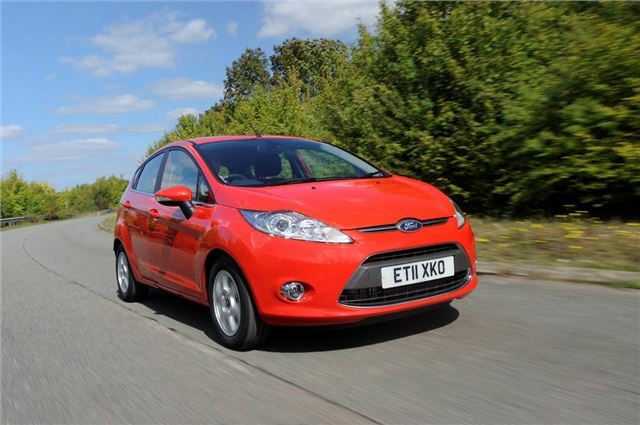 Ford has added a new ‘Hot Metal’ special edition to the Fiesta range, as well as adding the ECOnetic engine to more trim levels. The additions mean you can now buy a low emission version of the bestselling Fiesta in three trim levels – entry-level Edge, mid-spec Zetec and top-of-the-range Titanium. All three of the new ECOnetic models come with a 1.6-litre Duratorq engine, which emits 95g/km of CO2 and delivers combined cycle economy of 78.5mpg. The cleaner, more economical performance is owned to improved aerodynamics, low rolling resistance tyres, modified engine calibration and different gear ratios, as well as a few other small enhancements. The ECOnetic models start at £13,895 for the Edge model, which comes with air-conditioning but little else in the way of luxuries. Mid-spec Studio Zetec models come with alloy wheels, fog-lights, enhanced styling and aerodynamics, three spoke leather steering wheel, and ambient lighting, and is price at £14,445. The top Titanium ECOnetic model is priced at £15,645 and features DAB radio, Bluetooth with voice control, USB connectivity, cruise control, automatic lights, automatic wipers and assorted styling upgrades. Besides the new ECOnetic models, For has also added a Hot Metal special edition, which is on sale now priced from £15,695. It features piano black trim, black leather seats and 17-inch alloy wheels and a few styling enhancements. It’s fitted with a 1.6-litre Duratec engine which produces 134PS. The Hot Metal Fiesta is limited to 1,000 examples and is available in Panther Black, Midnight Sky and Frozen White.